One of my latest Zoids from Flickr, here is the revamped Command Wolf! The Command Wolf is a fast and agile medium-sized Zoid. Its speed gives it a great deal of flexibility, allowing it to perform various roles. Command Wolves have been used in strike, recon, and assault operations, amongst others. My revamp is complete! I completely revamped my original Command Wolf by bulking the legs, changing the back mounted turret, and reworking it's entire back half. The head was extended and raised up a stud to be more accurate to the actual Zoid. 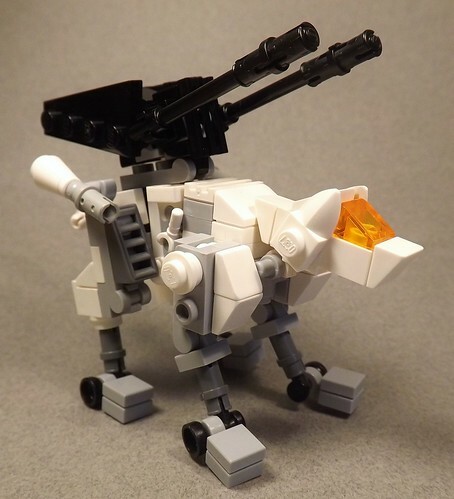 The turret is a modified design made by Sage (a fellow Zoider on Flickr) that he used on his Command Wolf. Same photo as main image. View on Flickr for high definition. Comments, ratings, and feedback is greatly appreciated. KP out! Nice details! I love your Zoids! Epic looking build you got here! Very nice addition to your Zoids collection! Nicely done indeed and you certainly captured the Zoids feel to it! I still remember the ones I had with their little wind up motors when I was young many, many, many (well maybe not quite that many) years ago but I get you the point. Bravo! A good looking machine that really captures the feel of the original Zoids toys. I like how you've made the feet and also how the turret is quite large in proportion to the body, which was typical of the smaller Zoids. Very creative and detailed! I love it!